I received a bunch of bell peppers through my organic buying club and needed a recipe that used a large amount of peppers so I could cook them before they went bad! This recipe is great because you can use peperonata for so many things. It’s a typical summer dish in Italy and is often eaten at room temperature or cooled. I placed it over bucatini but it can be eaten alone (hot or cold), with brown rice, used as a side dish, with eggs in the morning, served atop polenta or as a bruschetta, in a lasagna, and the list goes on. 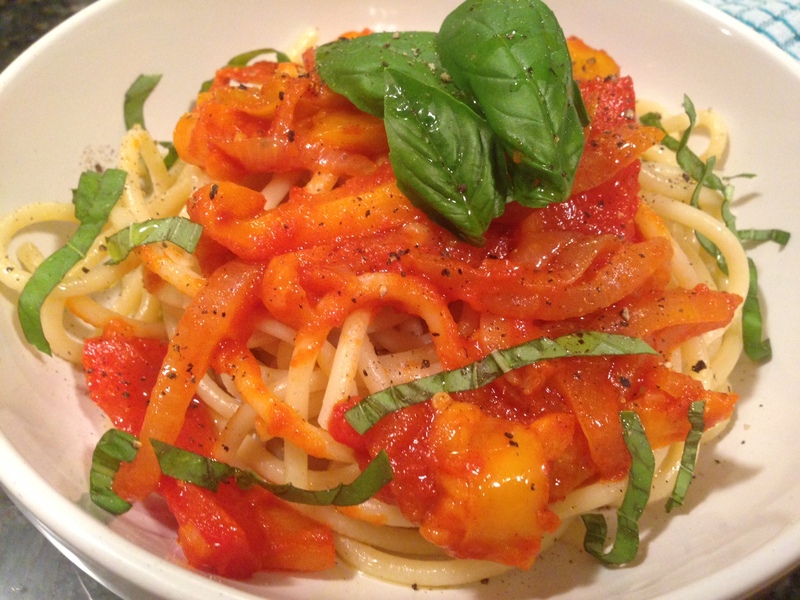 It’s so simple to make but the key to a great tasting peperonata is to make sure that your peppers are ripe and sweet. This is what gives the dish its unique flavor. In a medium sauce pan over medium high heat, place your onions in the pan and sweat them out until they turn translucent. You don’t want to brown them! Add your garlic and sliced peppers. Cook for about 3-5 minutes and then add the wine, tomato puree, and salt and pepper. Stir to combine well. Lower heat and cover. It should be simmering. Stir occasionally and if it seems too dry, add some more tomato puree. Cook for about 10 minutes covered. Remove cover and cook for another 10 minutes or so or until peppers are soft and most of the liquid has evaporated. Season with more salt/pepper if needed and top with basil!